Planning an event is no small feat, the challenge is hard. We had many experiences in the past of organizing meet-ups and gatherings, and it made us realize the importance of a companion app. We really wish we had known about one great event planner apps before; it would have saved us a lot of pain and money. Thankfully, we will be reviewing this app for you to reap the benefits and organize an awesome event yourself. We’re happy to present to you an amazing cross-platform Lifestyle app called Mustard. Getting together has never been easier and effortless as it is now when we have it. 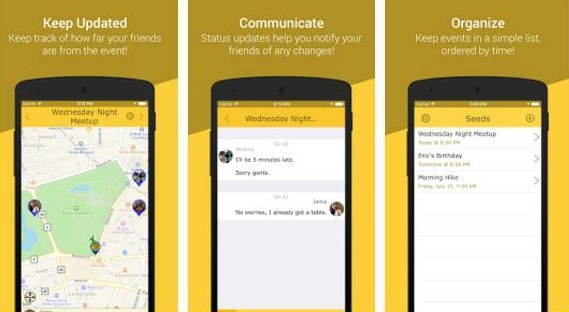 If you want to create events and also know where your friends are when they’re late, then Mustard is a perfect choice for you. Developed by Mustard Co and available for both Android and iOS users, we are fortunate to have a helpful tool for organizing and coordinating events. Mustard is easy to use as well. All you have to do is sign in with your Facebook account or by writing your name and uploading a photo of you only. Then you will be able to create as many events as you can, keep them organized, set a time to start tracking and keep updated with minimal effort. Note that the app uses your background GPS and even though that the developers are trying to minimize the battery usage, it will still dramatically decrease your battery’s life. With just a few simple taps you can enjoy a real event planning and location tracking tool, so make sure you check it out and download it – it is free on the App Store and on Google Play.